Deep and full bodied. Makes up to 210 6 fl oz cups. Mountain grown. Aroma seal. Questions? 1-800-937-9745. Discover other Folgers coffee varieties and recipes for every occasion at folgers.com. Canisters are recyclable where programs for this package exist. Instructions: . For All Coffee Makers. For best brewing results, we recommend:. Cold Water: 1 Serving (6 fl oz), Folgers Coffee: 1 Tablespoon. Cold Water: 10 Servings, Folgers Coffee: 1-2 Measuring Cup. This canister makes up to 210 suggested strength 6 fl oz servings. Coffee is excellent! Walmart sales online, NOT so much. We burn a lot of coffee, coffeeholics, if you like. We "attempt" to buy 10-12 units at a time. This not only eliminates ordering frequently, it assures our purchase qualifies for "FREE SHIPPING!" What is frustrating is the online purchase is limited to four (4) units of any particular flavor. Four does not get you to the minimum $$ amount needed to qualify for the FREE SHIP! This requires you to buy some other flavor or product you don't want. This limit applies, regardless if the item is on sale or not. Solution would be to allow the purchase of a sufficient quantity to meet the requirement for the FREE SHIPPING! 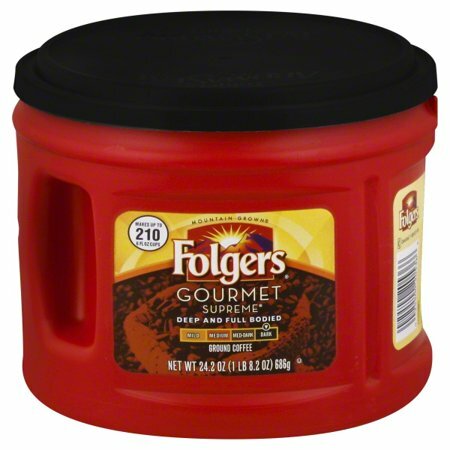 Our local Walmarts have stopped stocking this brand of Folgers coffee and found ordering it online was very easy. We have been buying this brand for 10+ years and don't understand why it is no longer on the shelf. Hoping you don't stop stocking it online and, ultimately, that you start carrying it in the store again. This coffee is strong and delightful. Of course i enjoy creamer in every cup, and the strength gets me thru my day. Also has the most wonderful aroma! I've bought Great Value dark roast forever because I'm just not a fan of Folgers Black Silk. This coffee is wonderful, darker than French Roast but not as dark and bitter as Black Silk. Smooth and delicious, bought 4 cans!